Tesla CEO Elon Musk is at it again. In a classically cryptic tweet to his more than 5.5 million followers earlier this week, Musk teased that a new product announcement was coming on October 17. What made the tweet even more intriguing is the fact that Musk said the new Tesla (TSLA) product was "unexpected by most." Musk hinted that the news won't have to do with Tesla's controversial merger plan with SolarCity (SCTY), the alternative energy company run by two of Musk's cousins. A separate Tesla/SolarCity event was happening on October 28. 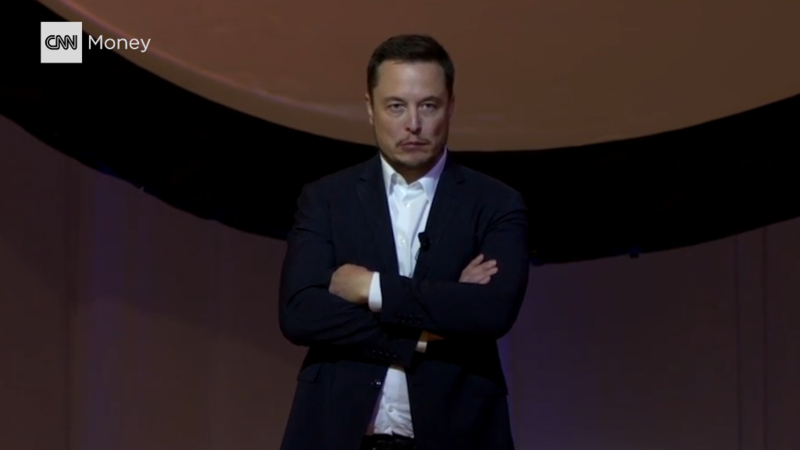 It's also unlikely that Musk will be talking about his rocket company SpaceX since he clearly indicated that it was Tesla that would have a new product. So what does Musk have up his sleeve? Musk is a showman who has been known to oversell his teasing announcements, and CNNMoney's auto guru Peter Valdes-Dapena doesn't think the news will be all that exciting. He told me that it's unlikely to be a new vehicle. He thinks it could be an updated version of one of Tesla's existing products or a more detailed look at the upcoming Model 3 -- the "affordable" Tesla that's due out at the end of 2017. There are rumors that it could be a reworked version of Tesla's Model X SUV -- a vehicle many are referring to as the Model Y. But Twitter users and auto and tech bloggers are hoping it will be much more than that. After all, Musk already has indicated in his new Master Plan for Tesla that a pickup truck, heavy-duty cargo trucks for freight shipping and some sort of mass transit vehicle could be in the works. So maybe a Tesla Semi or a Tesla Bus will be the product announcement? Musk also hinted that Tesla will one day let its customers share their cars with other people -- if/when autonomous driving vehicles get the green light from regulators across the country. It seems unlikely that Tesla will launch a true ridesharing service next week though. It's probably too soon. But one rumor that kept resurfacing this week is that Tesla may launch a motorcycle known as the Model M.
Luckily, we only have to wait a few more days to find out just exactly what Musk is unveiling. Some have even joked that it could be a Tony Stark-styled Iron Man suit, fitting since Robert Downey. Jr. has said he's modeled his version of the Avengers character partly on Musk. What is certain though is that none of the wacky, but hilarious, ideas created by the parody Bored Elon Musk Twitter account will be announced Monday. It's too bad though. One of Bored Elon Musk's most recent proposals? A drone to nag co-workers to look at their inbox more frequently. Maybe Musk will announce on Monday that Tesla is buying all of Bored Elon Musk's fake patents? A boy can dream.